Description: This evergreen coniferous tree is 70-120' tall at maturity, forming a long straight trunk and a narrow crown that is oblongoid or oblongoid-conical. 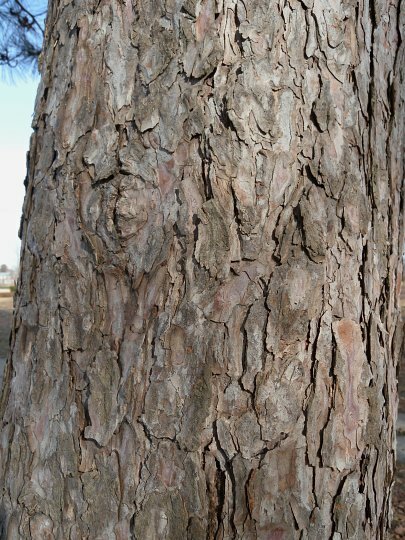 Trunk bark is reddish gray or reddish brown, forming irregular plates with a flaky surface. The bark of smaller branches and twigs is mostly gray and flaky. The lateral branches are mostly ascending to widely spreading, although lower branches are slightly descending. Most of these branches are curved, rather than straight. 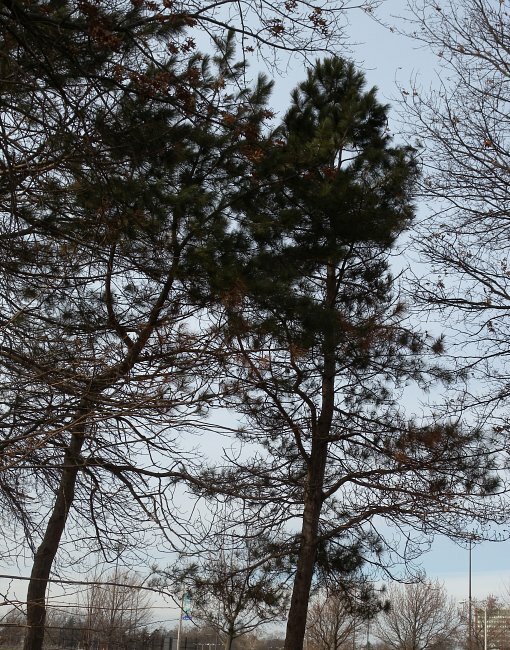 Because Red Pine is self-pruning, the lowest branches readily detach from the trunk. Dense tufts of needle-like leaves occur toward the tips of branches, while branches toward the interior of the crown are often devoid of leaves. Individual leaves are 4-6" long and dark green; if a leaf is bent, it usually breaks cleanly toward the middle. The leaves are organized in bunches of 2 and they live for 2 years. Red Pine is monoecious, forming pollen cones and seed cones on the same tree. The small pollen cones occur in clusters at the tips of twigs; they are rosy pink to purple, ovoid in shape, and ½-¾" long. The small seed cones are initially reddish brown, but they change color and become larger in size after the blooming period. The cones are cross-pollinated by the wind during the spring. It takes seed cones 2 years to mature and release their seeds. 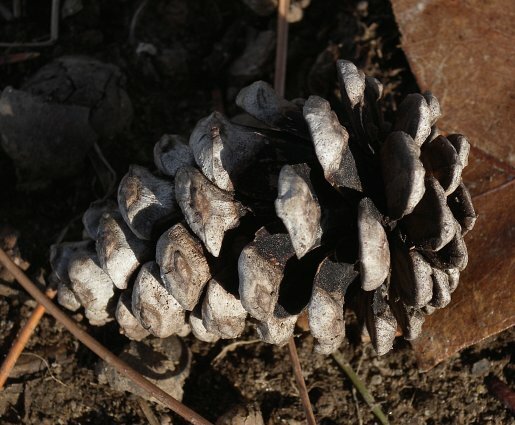 A mature seed cone is 1½-2½" long and brown to grayish brown. Unopened cones are conical-ovoid in shape, while opened cones are ovoid-globoid. The woody scales of the seed cones are thickened and variably keeled underneath; they lack prickles. Two seeds develop at the base of each scale. At maturity, the seeds are dispersed by the wind; they typically travel as far as the length of the tree. Individual seeds are about 3-5 mm. (1/6") long and they have membranous elongated wings up to 20 mm. (¾") long. The woody root system has lateral roots that spread widely and somewhat deeply; sometimes there is a poorly defined taproot. Occasionally, this tree occurs in colonies where the local habitat is favorable for its development. Cultivation: The preference is full sun, mesic to dry conditions, and a sandy or rocky soil that is acidic. Individual trees can be short-lived if growing conditions are unfavorable, otherwise they can live up to 500 years. Because of its finicky requirements, Red Pine doesn't adapt to cultivation as readily as Pinus strobus (White Pine) and other widely cultivated pines. As a result of its strong root system and spartan foliage, a healthy tree is highly resistant to wind-throw. Range & Habitat: In natural areas, the native Red Pine is rare in Illinois and state-listed as 'endangered.' Thus far, it has been found in only 3 counties (see Distribution Map). It is more common in boreal areas to the north and northeast of the state, where it can become a dominant tree. Sometimes Red Pine is grown in plantations, and some colonies in natural areas have been deliberately introduced (which are not included in the preceding map). In Illinois, habitats consist of upland sandy forests, thinly wooded bluffs along rivers, and sandstone cliffs. Red Pine is rarely cultivated as a landscape tree. 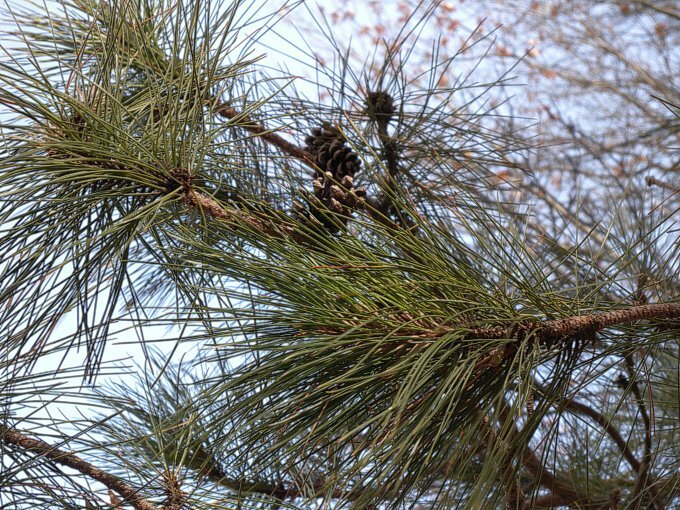 Faunal Associations: There are many species of insects that feed on Red Pine and other pines. This includes the caterpillars of the butterfly Callophrys niphon (Pine Elfin) and the caterpillars of many moths (see Moth Table). Other insect feeders include the caterpillar-like larvae of several sawflies (see Sawfly Table), Aphrophora saratogensis (Saratoga Spittlebug), Matsucoccus resinosae (Red Pine Scale), various plant bugs (Dichrooscytus suspectus, Phytocoris pinicola, & Pilophorus gracilis), the shield bug Tetyra bipunctatus, the leaf-footed bug Leptoglossus occidentalis, the larvae of many long-horned beetles (Cerambycidae), the bark beetles Ips pini and Ips grandicollis, and Conophthorus resinosae (Red Pine Cone Beetle). Among vertebrate animals, the seeds are eaten by several upland gamebirds and songbirds (see Bird Table), White-Footed Mice and Meadow Voles, and Red Squirrels. Some birds prefer to use pines as a location for their nests (various warblers, Bald Eagles & hawks, etc.) and as a place to roost (Evening Grosbeaks and owls). Young saplings of Red Pine are sometimes browsed by White-Tailed Deer and Cottontail Rabbits, especially during the winter, when little else is available. Comments: In the Great Lakes region, Red Pine has been used to make paper pulp, utility poles, railroad ties, and lumber for construction purposes. It has considerable economic importance. To a greater extent than many other pines, Red Pine has a tendency to concentrate its leaves toward the tips of branches in large tufts. Other characteristics that are useful in making an accurate identification include: 1) its leaves are organized in clusters of two, 2) the length of its leaves is 4-6 inches, 3) its rather short seed cones are no more than 2½" long, and 4) the woody scales of its seed cones lack prickles.